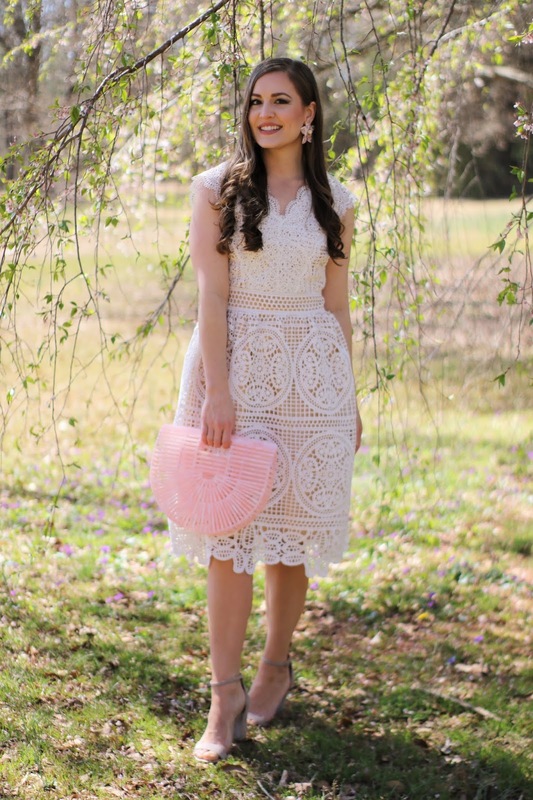 This dreamy dress from Chicwish is definitely going to be a go-to for all my Spring events! It's so beautiful, and the lace is just so intricate and sophisticated. 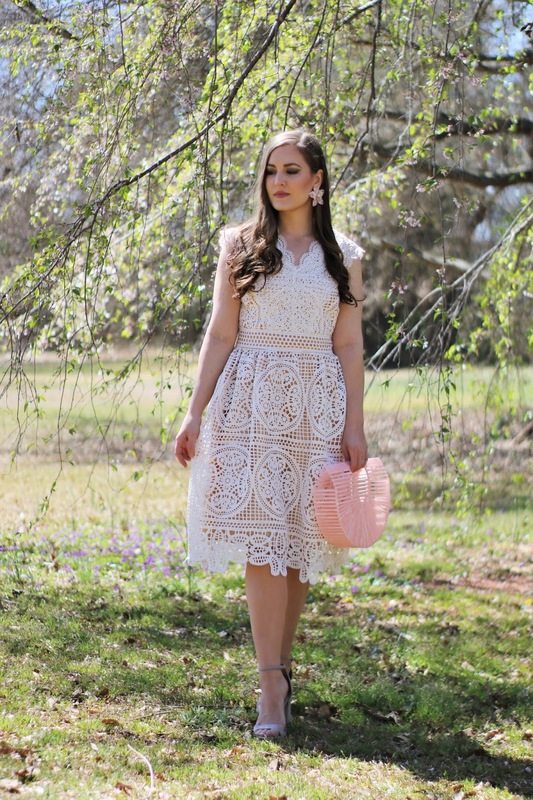 This dress would be perfect for a bridal shower, or Easter, mother's day (my pick! ), or a little Spring picnic, if that's the kind of thing you're into. I also appreciate that the neckline is delicate and interesting, but you can wear a regular bra with this dress! Major plus in my book. My sister actually wore this dress, too, for a few pictures I took of her, and I thought it looked equally as beautiful on her slightly different body-shape. The waistline and A-line silhouette would look perfect on a ton of different shapes. I'm also loving these little earrings I'm wearing! They're one of my favorite accessories right now, especially nice for Spring! Add your favorite Summer bag, and a cute little sandal, and your look is complete! A cute little straw or bamboo bag and cork heels or espadrille wedges would also look so cute with this, don't you think? I'm eyeing some espadrille wedges, right now, and I'm excited to find the perfect pair. I think I'd wear those a LOT during the coming months, and I definitely need to invest in a quality pair. I hope you guys are having a wonderful week, and have a lovely weekend! Thanks for reading! 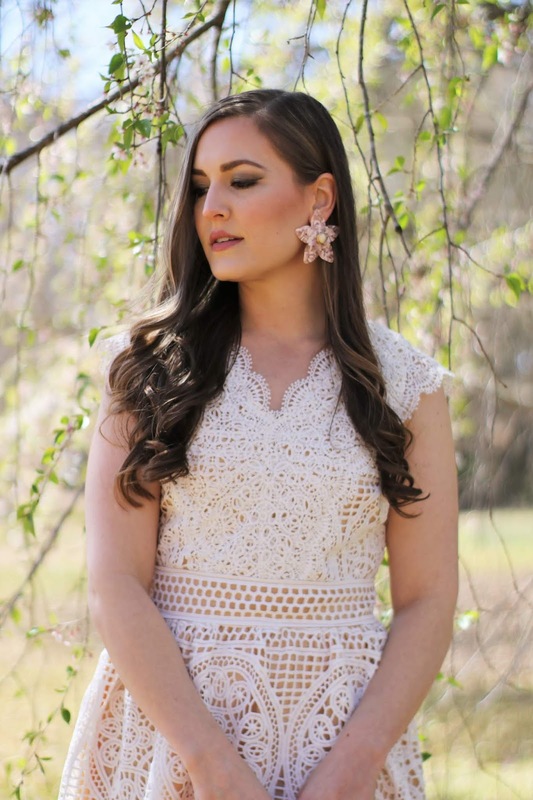 Such a gorgeous dress, it's such a perfect look for spring! You always find the BEST stuff on Chicwish and I'm a touch jealous! Thank you so much, Felicity! This dress is one of my favorites right now, for sure! Super pretty! Indeed this a is a perfect white dress, love everything about it. Thank you so much, Benita! I hope you're having a lovely Thursday, so far! 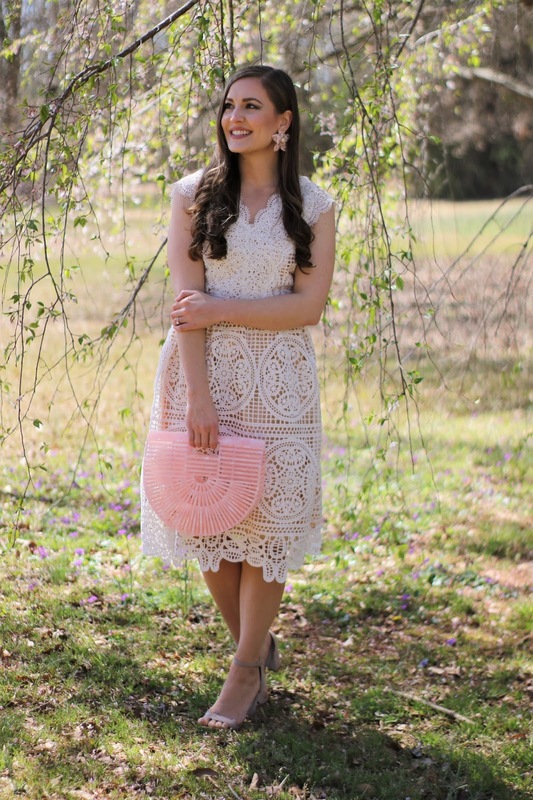 This dress is gorgeous, at first I thought it was pale pink, against the bag, but it's so delicate and cute! Thank you, Lorna! I hope you're having a great day! I love your dress and I have one similar from Chicwish too. But now the sun is missing oh! I hope the warm weather comes back for you, Marisa! Enjoy your weekend! This is really such a dreamy dress. Isn't it? I seriously love the design! Thank you, lovely! I'm in love with those earrings!! Statement earrings are the best!! Aren't they? These pretty flower ones are just perfect for Spring! Thank you, Jodie! This dress is so beautiful. I liked so much. Thank you so much, Lizzie! You're too sweet! I hope you're having a great Friday! This is a very beautiful white dress. The lace is delicate and looks very high-quality. It is such a bonus when you can wear a bra with a dress like this. The pink bag is so pretty also. It really is great quality, and I LOVE that I can wear a regular bra! Thank you so much for stopping by, Elle! Your dress is so beautiful! I love to wear lace dresses in warmer weather. Me too, Kathrin! They're some of my very favorite styles! Thank you for the sweet comments, you're the best! Thank you so much! Have a lovely weekend! I never get disappointed when I see your looks. 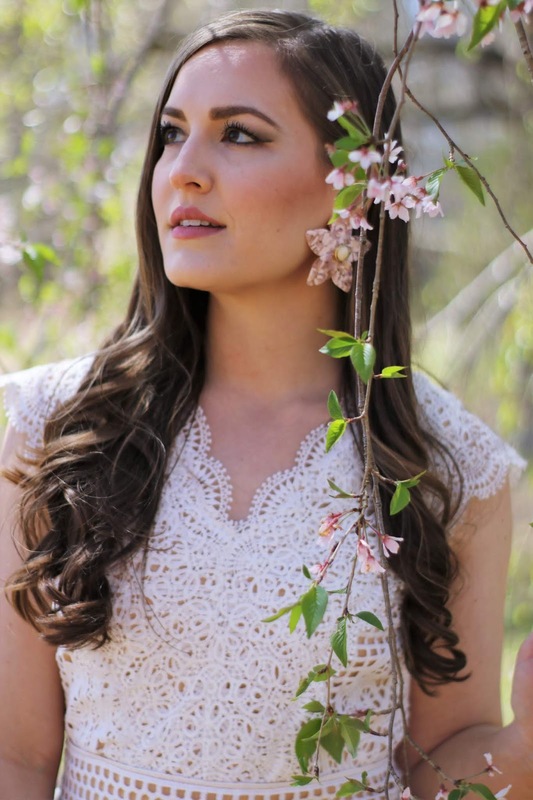 Once again you get my attention, and leave my mouth open, with this white lace dress perfect to wear in the spring and that enchants any woman. By the way, the flower earrings are very cute. Have a very happy Friday, my dear. Thank you so much, Filipe! I really do love this dress and the earrings together - one of my favorite combinations! I hope you have a happy Friday, too, and enjoy your weekend! It really is the perfect dress. So pretty. Thank you, Sophie! I hope you're having a lovely day! Thank you so much, Melody! I hope you have a great weekend! Love the dress and I totally love it with your cute summer bag. Thank you so much, lovely! I hope you're enjoying your weekend! Thanks, Kinga! Enjoy your Saturday! GIIIIIRL I need that dress in my lyf! So chic and Spring perfect!! Thanks so much, Natalie! It is the best! Hope you're having a lovely weekend! Stunningly beautiful dress! You look perfect as always! Such a stunning dresses! I completely agree with you that is perfect for spring. Also your earrings are so gorgeous! I really like whole outfit, thank you for inspiration! Love this dress on you! So pretty!! This dress is so lovely, Jessica! The texture and neckline are my faves! Isn't it fun? Thank you so much, Lizzy! I am in love with this white dress! 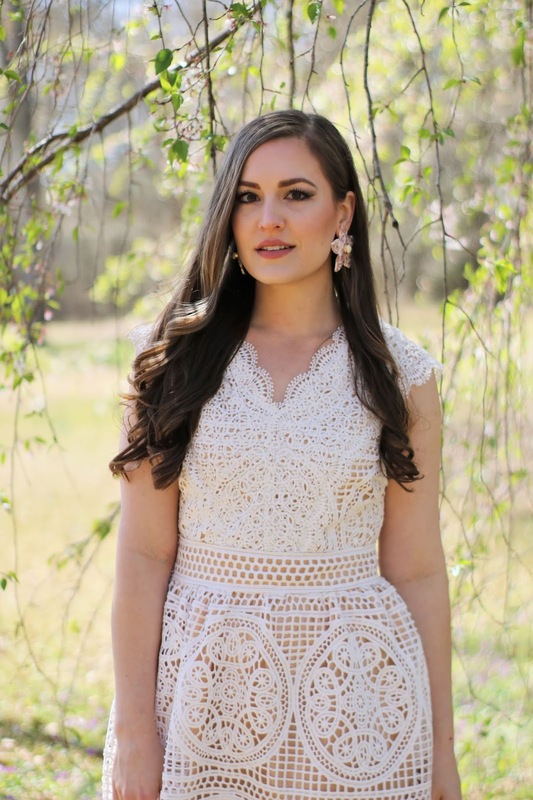 The lace is beautiful and it would be perfect to wear for Mother's day. You look stunning Jessica!